Join docent Millie Liu for a tour of Shibata Zeshin: Lacquer Paintings, followed by an art discussion over a glass of iced tea in the café. Visitors meet the docent at the entrance to the museum. Pictured left: Shibata Zeshin (1807–1891). Butterfly and Wild Rose. Japan, Meiji period (1868–1912), 1885. 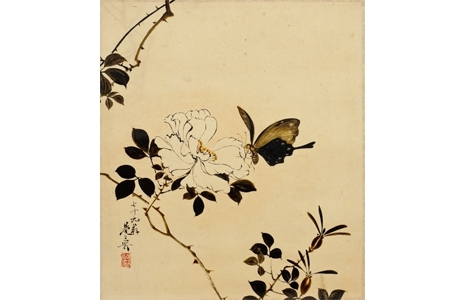 Hanging scroll; lacquer on paper. Gift of the James Edward and Mary Louise O'Brien Collection, 1978. (4658.1).